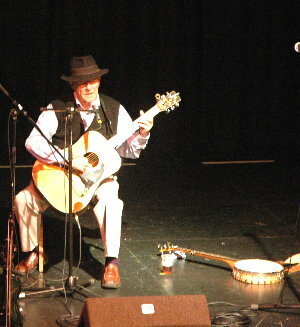 Highlights of the Fifth Gainsborough Folk Festival 2004. 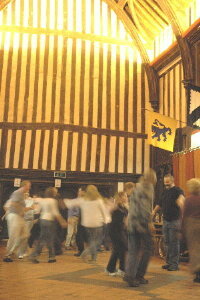 The festivities kicked off in tradition fashion with a Grand Ceilidh featuring the Rosianna Band in the medievial splendour of the Great Hall. 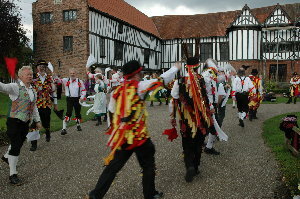 A slight change in format this year brought a formal folk club into the Lower Great Chamber of Gainsborough Old Hall. It was great to see our old mate John Stothard who had made the trip down from foriegn parts to be with us. Meanwhile over in the Eight Jolly Brewers, there was standing room only in the first Singaround of the festival and even an overspill musicians session going on in the bar downstairs. 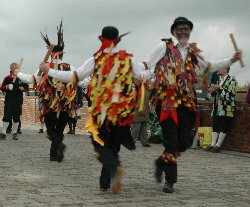 Saturday dawned bright and clear allaying fears that the torrential rain of the previous eventing would result in some seriously soggy morris men. Meanwhile- back at the Old Hall the singing and guitar workshops were interspaced with some serious retail therapy in the Craft & Music Fair. The afternoon concert in the Upper Chamber was a superb blend of the talants of our own Bob Cleveland and an (almost) reunion of the original Broadside with John Conolly, Brian Dawson and Bill Meek. 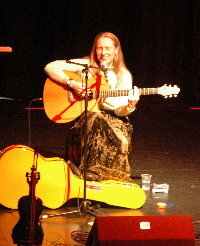 A wonderfull concert ! Across at the 8 Jolly Brewers, the BIG singround was in full swing with a one hour special of the songs of Keith Marsden hosted by Cockersdale. 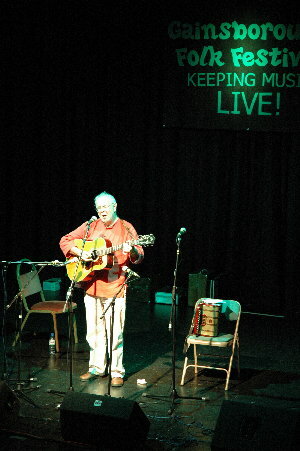 Later in the afternoon the action moved across town to the Trinity Arts Centre where a large audience were treated to 'Teatime with Derek' an informal meeting with the redoubtable Mr Brimstone and his unique sense of humour. 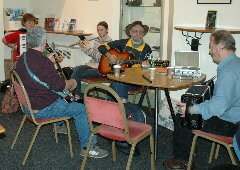 This was followed by a workshop with Jez Lowe where some of the secrets of succesful song writing were revealed. Time for the Main Concert in the auditorium and what a concert it was ! 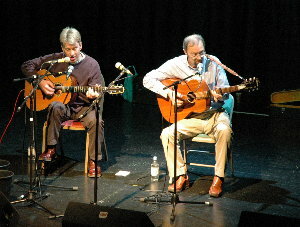 After a short interval where raffle tickets for the autographed guitar were being snapped up, the marthon concert continued with a very impressive set by Cockersdale and the auditorium was filled with enthusiastic harmony singing. 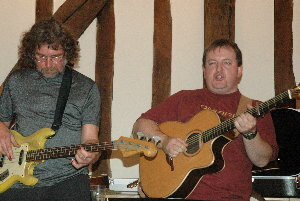 Finally, it was time for the welcome return of Jez Lowe and the Bad Pennies. 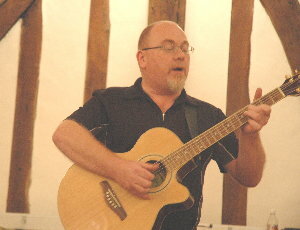 Jez has long been a festival favourite and it was great to see him back again this year. Meanwhile over at the Brewers the singaround was still going strong and approaching its 12th hour ! 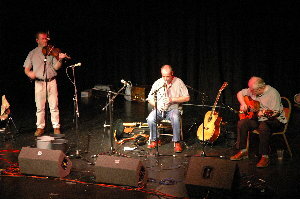 An inpromtue session in the bar opened the day which was thoroughly enjoyed by all and looks set to be a regular festival sunday institution. 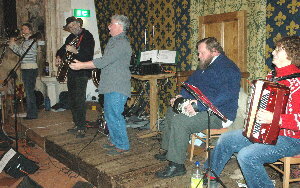 Back in the Vestry there was a concert with our own JB (John Blanks) and the Cater Twins (Gwenda and Terry) together with Skatz and Sensible Shoes. 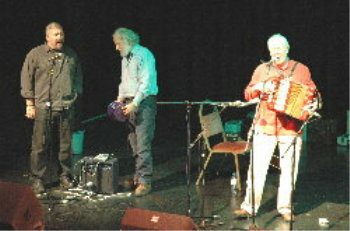 Mark & Paul were followed by another old mate from Grimsby- John (Fiddlers Green) Conolly. 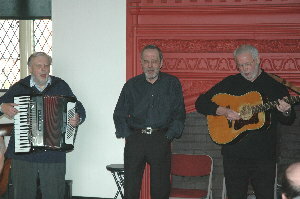 The Grand Afternnon Concert was concluded by more of Lincolnshires finest- Bill Walley and Dave Fletcher and as if we hadnt had enough treats over the weekend they were joined by Mr Conolly for the finale. A terrific Weekend was rounded off with a singaround in the Trinity Centre Bar and it was unanimously agreed theat the fifth Gainsborough Festival was the BEST YET- roll on 2005 !! 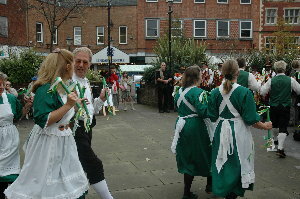 This years festival will be October 21st - 23rd 2005 put it in your diary! Festival organisers would like to thank everyone who helped to make the weekend such a success whether as a major sponsor or as a participant. It wouldn't happen without you.